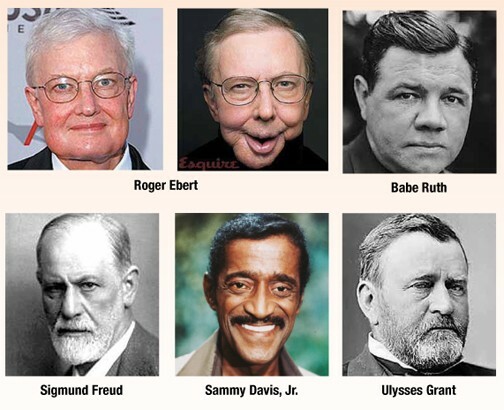 What do Ulysses S. Grant, Civil War General and President of the United States; Babe Ruth, the Bambino and most famous baseball player of all time; Sigmund Freud, neurologist and founder of psychoanalysis; Sammy Davis, Jr., entertainer, singer and member of the “Rat Pack”; and Roger Ebert, film critic and co-creator of the thumbs up/thumbs down movie review, have in common? They all succumbed to various forms of oral cancer. Grant’s occurred near the tonsillar area, the Babe’s was nasopharyngeal (the upper throat), Freud’s cancer occurred on the soft palate, Ebert had thyroid, salivary gland and jaw cancer, and Davis’s was throat and mouth. 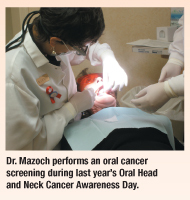 Dr. Mazoch and her team are ready for Oral Cancer Awareness Day. My usual column for the Women’s Journal concerns the happy occasion of presenting a transformation from unattractive teeth to a beautiful smile. Yet, each year, one article is all about oral head and neck cancer. Why do I devote an entire article every year to discussing this morbid and disfiguring disease? Because a dentist treats more than just your teeth. A dentist is concerned with your overall health. A dentist performs an oral cancer examination of your mouth by looking for abnormalities, by feeling for growths, and sometimes by using a fluorescing light to enhance visualization. A dentist is your best bet for an early diagnosis of oral cancer. And an early diagnosis usually means complete cure with little discomfort. Unfortunately, most head and neck cancers are discovered at a late stage. Late stage oral cancer is difficult to cure and the treatment is painful. There will be nearly 42,000 cases of oral and pharyngeal cancer diagnosed this year. Only 57% of those diagnosed will be alive in 5 years. Smoking and alcohol overuse remain the major cause for head and neck cancers. However, among young non-smokers, a virus – Human Papilloma Virus (HPV16) – appears to be replacing smoking and alcohol as the predominant causative factor for those under the age of 50. You may recognize HPV, a sexually transmitted virus, as the cause for 90% of cervical cancers. Women in particular are gaining on the men in new oral cancer diagnoses. Previously, 6 men were diagnosed for every 1 woman. Now, the ratio is 2 men for each woman; not an encouraging trend for women. After all of this gloom and doom, there is hope. Visiting your dentist for professional teeth cleaning and checkups twice yearly allows your dentist to perform a thorough examination and evaluation of your oral cavity. We have high powered lights and magnification to look down your throat, at your tonsils, roof of mouth, cheeks, lips and the back, sides and under your tongue. We can palpate (feel) for swollen glands, hardened lymph nodes, unusual growths, or asymmetries. We can be the source of an early discovery. If you don’t have a dentist, PLEASE get one today. Dentistry is not expensive if you visit routinely and take care of yourself. It becomes expensive and time consuming when you neglect your mouth. So, do yourself a favor and be diligent about getting an oral cancer screening at least once a year. You are welcome to join us for our 7th annual Free Oral Cancer Screening on Saturday, April 19, 2014, from 10:00 to Noon. Make sure you are up to date with your dental visits.